Washing windows on the H+M store on Washington Street. Shiny windows. They have done a good job! To me it is still strange to see H&M abroad. I used to think of it as only something Scandinavian. Interesting and colorful details in the window reflections. When I was in Ireland they would come out and wash the windows every single morning. I even saw someone washing the bricks on the ground outside the door of their establishment. It was so clean. I never thought to get a picture of it though. This is an excellent reflection shot, with spotless clean windows! Life goes on waiting to be captured by an able lens, great work! Necessary for us who want some reflections in your photos. H&M all over the USA as it is all over Europe? Brilliant refelections, I see they have a Wendys' across the street. So interesting how the reflection dominates. The interior of the store is like a fleeting thought. 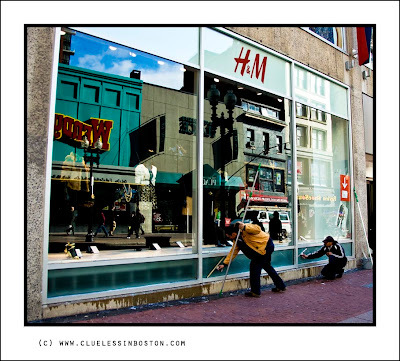 Lol - like some others I was astonished to see H&M in Boston ... the photo with its reflections is great. The sidewalk is really lilac? From the reflections in the window, I'd say they are window washers extraordinaire! Nice reflection. I have to confess to never shopping at Hennes & Mauritz. H&M !!! I did not know that this store could be also in USA, it's so popular here!